By LUDWIG VON KOOPA - The only thing dumb is the game. You're just fine. You'll have to deal with my camera quality with these pictures. ...Not that Detective Pikachu has great graphics anyway. I just wrote about how, prior to the release of Detective Pikachu, I didn't understand how anyone could understand its appeal other than SAG-AFTRA members. Now that I've played through the demo, what do I think of it? ...Well, like the game's actual plot, this isn't even going to be a post-page-break plot twist: Detective Pikachu is not good. Detective Pikachu opens up with Pikachu trying to get humans to understand him, but he just comes across as saying PIKA, PIKA. For some reason, this generic kid named Tim comes along and he can understand and talk with Detective Pikachu, but no other human can. 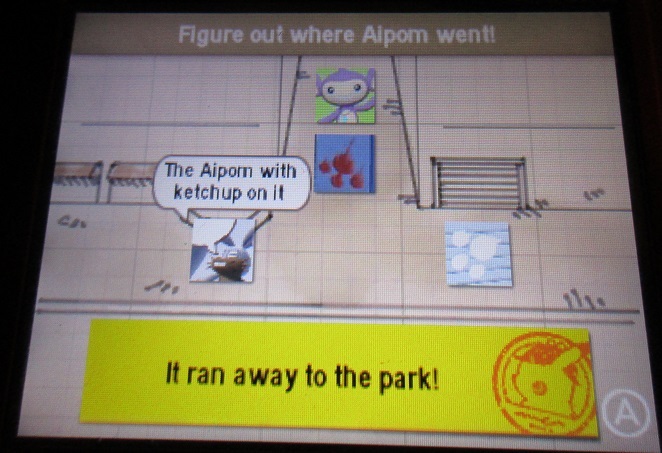 This group of Aipom appears, and they steal this girl's necklace. 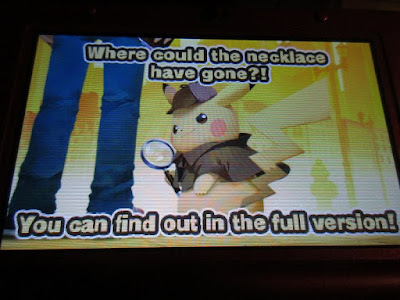 Detective Pikachu enlists Tim to track down the Aipom and get the necklace for the girl, because they literally have nothing better to do with either of their lives. The game features quicktime events that don't have a consequence for failure. Shout-out to the Moomoo Milk being sold at this food stand! Only Tim can successfully communicate with other humans, and only Pikachu can successfully communicate with other Pokémon — for some reason, Tim can only understand Pikachu, but no other Pokémon. Together, they interrogate witnesses and search for evidence in order to solve their mysteries. Once enough of that is gathered up, you can finish the segment by putting the testimonies and evidence together to reconstruct what happened, sort of like you're Miles Edgeworth. 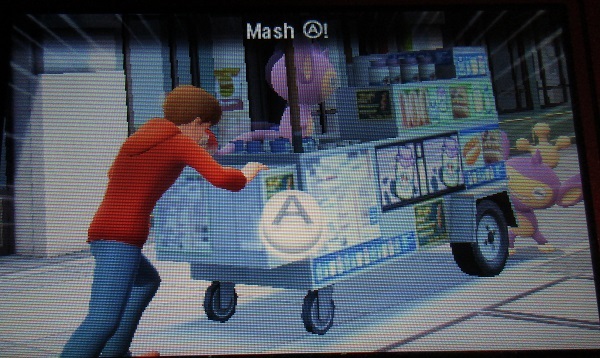 Except unlike Ace Attorney, the plot in the demo was quite easy to predict and it's a chore to go through. Going through all the menus and through your evidence feels sluggish. I had to go through this whole ordeal in order to be able to actually go to the park. As in, Pikachu prevented me from just walking to the park. Plus, unlike a proper visual novel, the writing quality here is decidedly average. Meanwhile, the voice-acting and animations remind me of a 3D-model version of Link: The Faces of Evil or some other kind of CD-i game. 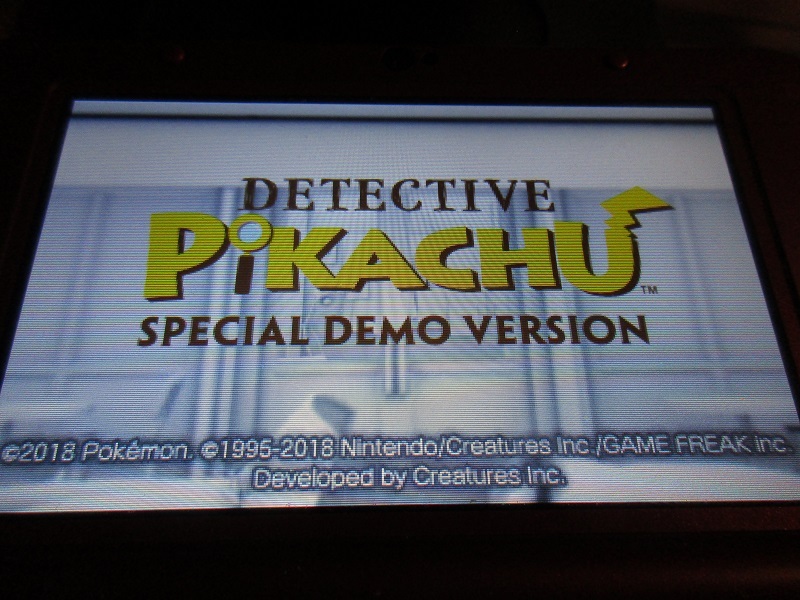 By the time the demo ended, I have absolutely no motivation to go on and buy the full game. I don't care about any of the characters or their problems. There isn't a riveting soundtrack to play along with. Everything is kind of ugly. The game is written for children (and probably does a disservice to getting children engaged because it assumes they're dumb), and for some reason, there is an Easy Mode as well. I'm not sure how the game can get easier when there is no possibility for failure. I can find out where the necklace went in the full version, but do I really want to? Detective Pikachu already begs Tim/the player in a whiny voice for attention during the investigation (“Hey Tim! TIM!”), only for him to give useless information or no information at all. He doesn't have any intelligence of his own, he's just summarising what you already know and trying to lead you through the game's bad user interface. Yes, Detective Pikachu — along with everyone else — talks. During cutscenes. Normal investigation gameplay, which also involves a lot of talking? Just text-based. I guess they couldn't afford the high SAG-AFTRA rates to truly fully voice-act the whole thing. That said, Detective Pikachu's speaking quickly becomes tiresome, which is a problem when the entire game's appeal is supposed to revolve around Pikachu talking. The game isn't even properly lip-synced and the on-screen captions don't even line up with the dialogue. The game lacks polish, that's for sure. Just to make it clear: The game is SO influenced by SAG-AFTRA, that not only is the point of the game just to watch cutscenes of people talking, but the story and gameplay mechanics of the game revolve around speech and acting. I'm convinced they blew all the budget on the voice-acting that is there and nothing on the rest of the game. Of course, these are all opinions just based off a demo. You could say I'm over-extrapolating. I don't think so, though. 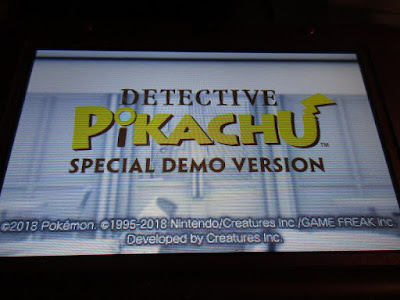 The demo represents the game. The demo is bad. Therefore, Detective Pikachu is a bad game. 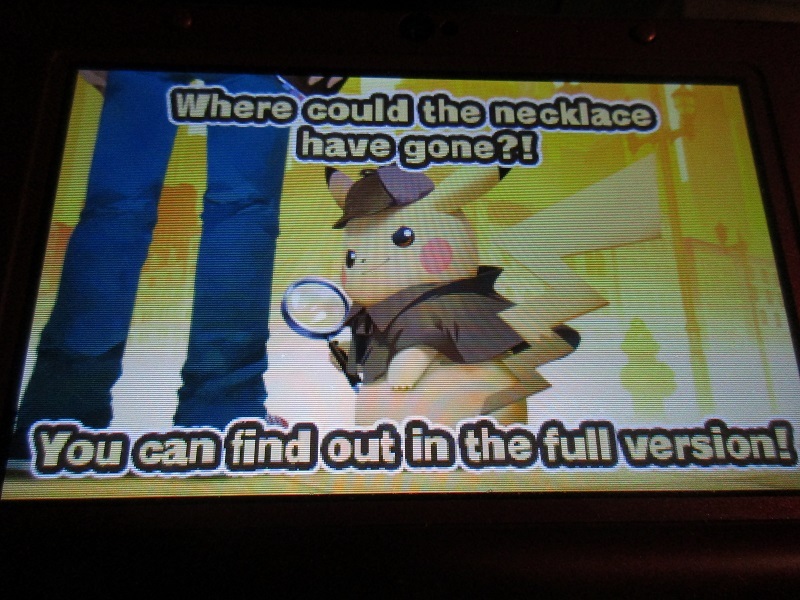 Just some deductive logic, Detective! Ludwig would ask what YOU thought of the demo, but that would imply that you should download it and try it for yourself. Don't even do that. You should have as little interest in the game as Ludwig does, being zero. For another failing game that gets a post-release demo, it's ARMS! The full retail game is for turning off your brain for a bit which I needed to balance Passover cleaning and child rearing. Yeah they treat you stupidly the entire game and the main idea of the story does not get resolved anyway. So you did buy the full retail game! You'd think that a mystery/detective adventure game would not be suitable for turning your brain off, though. Leave that for hack-and-slash games instead. NoA launching a demo after release tells me this game sold very poorly like ARMS and they are desperate for new sales. Or maybe they just didn't finish putting the demo together. Though Pocket Card Jockey's demo that transfers to the full game was released two or so weeks before the game's release date, so maybe the demo's existence was conditional on "Were first week sales good? Then party! If not, release a demo and send another push notification." I mean, they sent out a SpotPass notification for the actual game, and THEN again for the demo. So yeah... probably a little desperate. I just discouraged someone from getting Detective Pikachu on a Splatoon Discord server I am part of and they decided to go for Ace Attorney Investigations when we compared the two. What convinced them to change their mind? I said they need to have their expectations in check, that it is made for younger audiences in mind even if there are other Pokemon spinoffs that are actually tough like Pokemon Mystery Dungeon. Right, not all kid-centered games have gotten the memo to actually be challenging to fully complete for the kids-at-heart. Though Detective Pikachu is now your favourite 3DS game according to the 3DS friends list! Well there is no Advance wars icon for me to put there, now is there? It has now been switched to THE BABY game. Needs more THE BABY as the game icon and not the Screw Attack.